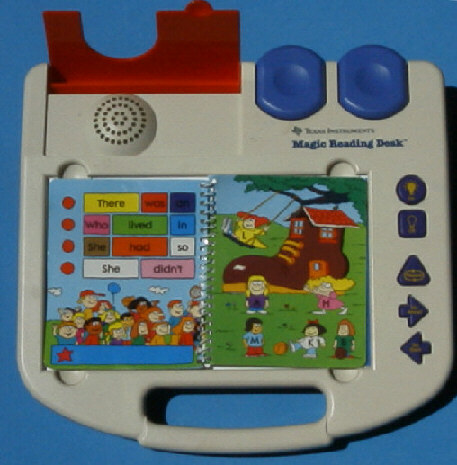 Size: 10.6" x 11.5" x 2.6"
Texas Instruments continued with the Magic Reading Tesk the spirit of the Super Speak & Read. The toy is a combination of the previous Speak & Read and the position sensitive keyboard of the Touch & Tell game. The integrated voice synthesizer will ask you different questions and you have to show with your fingertip the answers. The Magic Reading Desk uses exchangable Speech-ROM's in an expansion port. Each of them corresponds to a set of different booklets.